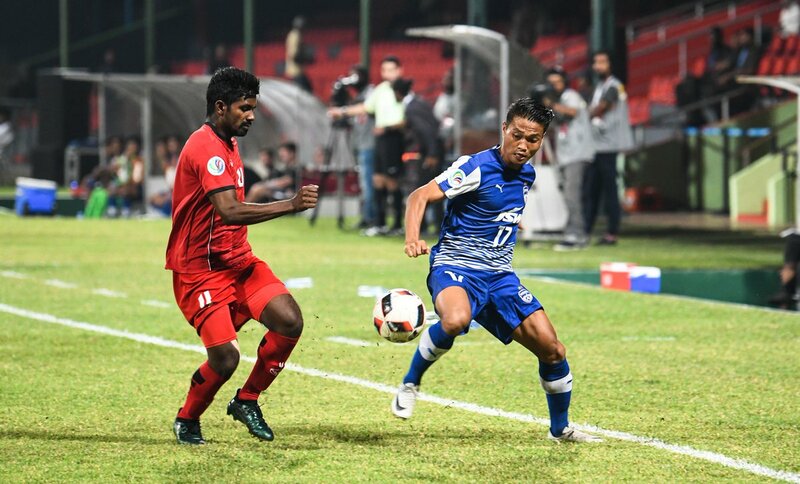 Bengaluru FC took on TC sports club in Male National stadium amidst heavy unrest in the region. The political situation of the country threatened to derail Bengaluru's hopes of going further into the knockouts but the side from South India decided to travel to Maldives to avoid a 3-0 walkover for no show. Bengaluru FC were coming on the back of an impressive home performance against FC Goa which saw them seal their knockout berth. Roca named a much changed 11 to take on the club from Maldives. Ralte took his place between the sticks while young Indians got a rare opportunity to impress. In a hot and humid atmosphere Bengaluru FC began the game with arguably their second string squad with Erik, Khabra and Toni, the only regulars from their full strength eleven. Nishu and Toni had a couple of shots early in the match that failed to test the goal of TC sports. On the other end Ralte was making some very good reflex saves to keep the former I-league champions in the game. However Roca will be concerned with the fitness of Khabra who had to be taken off in the 28th minute after picking up a knock. Khabra has been a regular in Roca's side in ISL matches. Boithang who was a big offensive threat throughout the first half swung in a beautiful corner of which Subhasish's attempt was well blocked to end the first half with neither side able to break the deadlock. Bengaluru began the second half on a positive note and they did not have to wait for too long before taking the lead. Toni's corner was glanced by Bheke to Semboi who duly headed it home to give the visitors an important away goal. The hosts were beginning to find it very difficult to get past the impressive defence of the visitors. Bengaluru FC made their second substitution in the 62nd minute when their star winger Udanta replaced Boithang. However Roca was forced to make his third change just minutes after as Zuala was unable to continue after picking up a knock. The side from Maldives were probably completely unaware of the strength of the Indian side in set pieces. Erik Paartalu who is already a fan favourite with Bengaluru faithful nodded in Toni's corner in 69th minute to double the lead for Bengaluru. The second goal sparked an immediate reaction from the hosts. A brilliant cross from right saw Anatolli with space to exploit and he dispatched the ball to the back of net to pull one back for the hosts. In a frantic four minute period, Bengaluru conceded once again as a miscued clearance in 73rd minute found Mahudhee who obliged to bring back parity to the game. Bengaluru FC lost their two goal advantage in matter of two minutes. In the 75th minute, the hosts made their first change of the match with Samir making way for Arif. Semboi provided the moment of inspiration for the visitors as he collected the ball and rocketed it to the back of the net from 20 yards to restore the lead in 78th minute. Hosts were on the front foot for the final ten minutes as they had chance after chance to get level but Ralte's heroics denied them. Mahudhee missed an one on one chance while the second half substitute Arif hit the wood work once and was denied by Ralte the other time. Four minutes were added on to the game and the hosts had enough time to bottle two more chances to lose the first leg. In a crazy game the side from South India managed to win 3-2 courtesy of a brace from Semboi. Bengaluru FC should comfortably make the next round barring a disaster back at the Kanteerava stadium in the second leg. Can Bengaluru FC win the AFC Cup with improved squad this season?